Few people admit to buying modern military shooters for their campaigns, and it's not hard to see why. The Battlefields and Call of Dutys are derided for being simplistic shooting galleries that hold the player back. But what if it didn't have to be that way? What if some game had already done it right? I think one game actually did get it right, and that game is the one responsible for everything: Call of Duty 4: Modern Warfare. Everyone knows the first-person shooter genre; it's about player creativity, about engaging with a space and shooting enemies in it. More recent shooters have been accused of laziness, unnecessarily punishing the player for engaging with a space in the way they want. But I think that's because these more recent shooters aren't actually trying to be shooters, they're trying to be experiences. Unfortunately, a lot of games don't handle the experience thing well. Before we can talk about the cure, we should talk about the disease, and 2011's Battlefield 3 is a great example of this. There comes a moment in the stealth mission in the game when your partner Campo tells you to "use your blade" on an enemy. The game forcibly switches you to your knife. The game has told you to be to avoid detection. Crouched, you sneak toward him, prepare to stab… and… die a horrible death. It's weird. One moment, you're standing, the next, your character collapses to the floor, dead. It's like you just had a brain aneurysm. Try switching to your gun, and you'll experience the same fate. No matter what you do, you will die—until you realize that you're supposed to stand. Despite being taught to crouch to avoid being seen, in this part of the level you're supposed to walk up behind an enemy and stab him with your knife. It's a contradiction of the way you've been taught to play, and there's no indicator given that you must stand. Logically, you should remain crouching, but if you do that, you will die. The game is scripted so heavily that the guard won't notice you until you're actually using your blade as Campo instructed, but even then, it's not really you, it's the game. You lose all bodily control as you plunge your knife into the man's neck, guards burst into the room, and you're positioned to run for cover as bullets fire all around you. You had no choice in this; all you got to do was watch it happen. Not only is the game's poor communication a problem, but there's no drama here, and that's a problem. IF WE'RE NOT EMPATHIZING WITH SOMEONE, THEN WE'RE NOT SO WILLING TO GO OFF ON A CRAZY JOURNEY WITH THEM. Drama is the thing that compels us to partake in the experience. It's the thing that connects us to the characters and the story. Drama is the single most important thing in stories, and that includes video games. Game drama, on the other hand, is a bit different from traditional drama, because players are in control. With traditional drama, the audience needs to empathize with the characters in question in order to partake in the emotional journey of the story. Games take that a step further: players must take action themselves, often performing difficult, time-consuming tasks. The action of play requires more of the audience than watching a film does, which means that player motive has to be rock solid. For a game to work, its design needs to be player-centric, encouraging and supporting the player in their action in order to move them along the path of the game's narrative. While the situations may fight the player, the mechanics must not. Unfortunately, most games rely on experience systems or other progress mechanics to encourage the audience to move. As a result, we get this big disconnect between gameplay and story. Sure, when you beat a level, the game might present a Dramatic Cutscene, but the real motivator for your progress is probably that nice, juicy "500 XP!" reward you get for completing the level, not the cutscene. The best games, though? They push us through narrative and gameplay. Half-Life is a classic because it's a game about wanting to survive. Both the story and mechanics support that. Instead of letting us stab the bad guy, Battlefield 3 takes over and says "hey, bro, I'll stab him. You sit back and watch." It rejects our participation to the point of killing us if we try to interject. This is the modern military shooter in a nutshell, a game so preoccupied creating an experience for its audience that it pushes us out. When a game robs us of our ability to participate, when its mechanics fight us, we no longer find the game fun. So it's gonna sound weird when I tell you that All Ghillied Up from Modern Warfare is one of the best levels in video game history. For a bit of context, I need to mention Safehouse, a gameplay-focused level that precedes All Ghillied Up. In it, British and Russian soldiers attack a compound, searching for a mass murderer, eliminating his bodyguards as they try to protect him. It's an enjoyable level, open and full of options. That said, Modern Warfare's gunplay is strange. Movement is the cornerstone of good shooter play, but Modern Warfare goes a different route; enemies shoot bullets that can't be dodged, and when you take even minimal damage, the screen turns red so quickly that it's best to hunker down and wait for your health to regenerate. The game's very much trying to say "hey, don't move around much. Treat this like a real firefight, rather than something like Doom." Your guns are virtually identical to each other, as are the enemy's; in a game like Halo, the guns you have influence the way you move, and the guns being used against you influence that as well. In Call of Duty, everything's the same, so movement doesn't change. Enemies aren't particularly intelligent or fun to engage. If you judge Modern Warfare as a shooter, it's comes up short. The gunplay and movement has no depth. So where do you find fun and satisfaction? In the experience. The game's deemphasis on movement is important; you're supposed to feel like you're in a real gunfight. 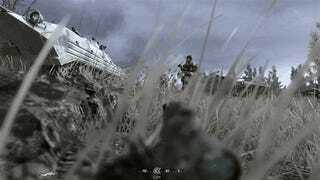 When people shoot at you, instead of boldly dodging like a superhuman space marine, cleverly navigating the space to dispatch your foes, Modern Warfare wants you to partake in an experience that's more along the lines of Black Hawk Down. It's about the drama of being in a battle, not the gameplay of running around shooting dudes. The level soon ends, and your commanding officer tells a story. Rather than simply exposit, however, Modern Warfare puts you in his shoes. Welcome to All Ghillied Up. Captain MacMillan rises up from the grass like a ghost. You're both wearing ghillie suits, a strange outfit that snipers use to break up their outline, making them hard to spot. He whispers that the suits will keep you pretty much invisible, setting the tone for the level. Following his orders, you make your way to a dilapidated structure where you can spot two guards. MacMillan tells you to pick one and shoot. When you do, he kills the other one. Moving on, you hear a group of guards—MacMillan tells you that there are too many, urging you to push past. You encounter another guard, eliminating him, and move on. An abandoned church has been re-occupied by a sniper. Taking him out is fairly easy, so long as you obey MacMillan's orders. Once you get past the church, which is being used to store missiles, you'll find yourself in an open field. MacMillan goes prone and urges you to do so. A group of soldiers and BTRs, a kind of Soviet armored personnel carrier, move past. It's one of the tensest moments I've encountered in video games. They're right on top of you and you've got to try to stay out of the way without moving too quickly to alert them. Getting through it is thrilling. Soon, you're on your way. This time, instead of taking out two guards, it's four. Just wait for MacMillan to tell you what to do, however, and you'll be fine. Next, you're sneaking through shipping containers, doing whatever MacMillan says. Or not. You can kill any of the guards he tells you not to kill—it's just incredibly hard to do so; they're far better armed than you are. Move along and you'll duck between guards for another tense crawl, this time underneath some trucks while guards mill about, looking for you. You'll get out soon enough, fortunately, making a mad dash through some weeds where you've got to take out a sniper, climb through some buildings, cross another yard, and encounter a wild dog eating a man's corpse. MacMillan cautions you to avoid shooting it, so you sneak around, then quietly walk through Pripyat until the end of the level. Up to this point, it seems as though Modern Warfare is just as bad as Battlefield 3. It might be less aggressive in the way it pushes its players, perhaps, but still just as limiting. So what makes it special? All Ghillied Up is a collaboration, an experience like Safehouse before it—like every level in the game, really. Unlike Battlefield 3, Modern Warfare works with you if you're willing to collaborate. Yes, both games will kill you if you break their scripting, but Battlefield 3, a character merely says to "use your blade," and doesn't bother to tell you that you've got to stand up. MacMillan's instructions, in contrast, are always clear. The situations presented in Modern Warfare make sense; of course you don't want to try running around when facing a dozen heavily-armed men and two BTRs. Standing up behind a guy in Battlefield 3, on the other hand, seems counterintuitive to remaining hidden. You may not want to try killing those men and their BTRs, but remember the church, the one used to store missiles? You can pick them up. You can use those missiles to take out the BTRs, then pick off the men. And it's not the only section where this is possible; the game never invites combat, but it certainly allows it. Modern Warfare knows you'll try, deliberately or inadvertently, to break its scripting, and takes measures to counter it without simply killing you. Remember the sniper in the church right before? If you wait for MacMillan's orders to kill him, everything goes smoothly. Ignore him and those four soldiers you skipped will attack your flank while even more hit you from the front. It's a tense, almost desperate firefight—you feel extremely vulnerable, especially because there's almost no cover at this point. It's all open fields, a stark contrast from the game's combat-heavy levels which offered plenty of cover. Shooting the wild dog against MacMillan's orders also isn't advised, because dozens of angry dogs will arrive and attack if you do. 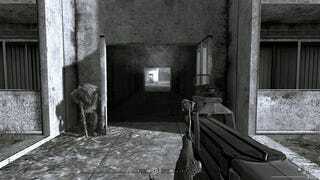 But with the silenced submachine gun you can find elsewhere in the level, it's survivable. And then there's this. Here, we have a player who kills a crazy amount of enemies and shoots down a helicopter! All Ghillied Up works hard to create an experience that can feel real, but only if you choose to let it. That's why, if you kill the sniper in the church too soon and survive the frenetic engagement immediately following, MacMillan offers a pithy remark about living dangerously; other games might have killed you if you were caught, but not Call of Duty. Modern Warfare knows you'll try, deliberately or inadvertently, to break its scripting, and takes measures to counter it without simply killing you. Other games don't work nearly as hard, and as a result, they often break the contract of the engagement. Battlefield 3 could have simply snapped your character in a standing position to kill the errant guard, something many games have done before; instead, it chose to kill you for not following instructions it failed to communicate. It punishes you for being creative, rather than reward you. It's not alone in this. 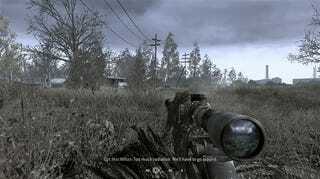 Call of Duty 4 always provides a reason for your actions; it carefully contextualizes each situation, clearly communicating its intentions and goals. The only way the average player is likely to break it is if they make the conscious choice to do so. It's still gameplay, but it's less focused on movement and shooting, and more focused on helping you play the part of a person in a distinct space and time. I think the folks at Infinity Ward who made the game understood that, despite the medium's name, video games don't actually have to be "games," at least in the traditional sense. Before Infinity Ward's founding, many of its employees worked on the Medal of Honor series of games. That series was created by Steven Spielberg, who had been working on his Oscar-winning Saving Private Ryan at the time. Medal of Honor transported players to another world, putting them on the same beach as the one depicted Spielberg's film. It was about living the experience, being a part of a moment. This is something only video games can do. It makes them special and wonderful. Don't get me wrong, I love traditional gameplay, and I recognize Modern Warfare's take might not match up to Halo's in terms of feel, interactivity, or intelligence required, but that's because it serves a different purpose. Judging Modern Warfare by Halo standards is a bit like judging a steak as if it were a brisket. Both are great and quite similar, but each is terrible by the other's standards. Traditional shooter gameplay serves the purpose of skill and creativity. It's about encouraging players to go do their own thing, solving combat encounters as they see fit. It's how everything from Doom to Destiny works. Modern Warfare's gameplay, in comparison, serves the purpose of experience. While I may prefer the former, I enjoy the latter a great deal as well. It's wonderful to be someone else for a while, to experience some moment in time that I wouldn't be able to do otherwise. It's a different kind of play, more role play than game play. I really like that incredibly tense prone section in Modern Warfare because of what it means for the game. While more recent modern military games have removed control options like lean, prone, and even jump, Modern Warfare doesn't just retain them, it actually implements them in interesting ways. It's wonderful to be someone else for a while, to experience some moment in time that I wouldn't be able to do otherwise. It's a different kind of play, more role play than game play. Many modern military games don't just kill you if you wander outside the boundaries they've set. They actually remove movement and control options. It's a process of reducing the things you can do. Battlefield 3 wanted me to walk up to a guy, press an interact button, and then run off in another direction. Modern Warfare gave me considerably more to do, even if it didn't always recommend them. Modern Warfare isn't like other shooters, and it's not trying to be. It's less about the traditional approach to shooting, which is about problem solving within a space, and more about constantly feeding the player new experiences, giving a purpose and a context to each control in the game. Modern military shooters are a different kind of video game. Yes, on the surface, the mechanics seem like they might be the same as games such as Doom, but these similarities are tangential. I think games like Call of Duty could be referred to as "experiential shooters," games which utilize the mechanics of the first-person genre as a way to put players in the shoes of another person. It's more about the emotional intensity of the experience than the mechanical complexity of the shooting. The experiential shooter is its own genre. It doesn't have to be set in modern military environments. It might not even have to be a shooter. In fact, you've probably played a great deal of games like this. They're called "cinematic," games that focus on set pieces, those awesome moments that make jaws drop. I don't believe there's a problem with jaw-dropping set pieces, but I do think the focus on the cinematic nature of these games actively harms them. Movies are things to be watched; games are things that require participation. Too many cinematic games create moments that disrespect the player's role in the experience. Games like Battlefield 3 reject the player's participation so they can show them a cool knife stab, and in doing so, they ignore the entire point of the medium: interaction. Modern Warfare's success is because it has all those cool cinematic bits, but it's always aware of the player's presence. It doesn't kill you for doing your own thing, nor does it pull an Uncharted 2-esque "hey, I'm taking over the camera to make you look at this cool explosion." It wants to create an experience for you to be a part of. Other games that have attempted this are too quick to create experiences that they merely want you to watch. Modern Warfare was great because it created an experience you could be a part of, if you wanted to. To put it simply, "cinematic" is bad, "experiential" is good. If a developer wants to create an awesome set piece, that's great! Valve has done an amazing job with showing players dramatic sequences without robbing the player of control or killing the player for trying new things. Half-Life 2's opening level doesn't force your eyes toward the Citadel; instead, you walk through a pair of doors facing it, and all visible lines in the scene point to the building. It encourages behavior without controlling it. When experiential games fail, it's because someone in the development process made a mistake, not because the genre is flawed. Crafting an experience players can be a part of is extremely hard to do well; All Ghillied Up came from the best of the best. Sadly, the cinematic aspect of the experience is all that competitors appear to copy; player-centric design is left by the wayside. I can't think of any other game, even more recent Call of Duty titles, that let me push the boundaries of their scripting the way the church firefight did, for instance. To put it simply, "cinematic" is bad, "experiential" is good. Games, by their nature, are interactive, meaning that considerations must be given to the person doing the interaction. When players can't participate, games no longer matter to them. Players are the most important element in the equation, because they're the ones doing the interaction. Modern Warfare's success comes from its respect for the player. Anyone making an experiential shooter would benefit from understanding its treatment of players.